The summer Milky Way is rich with deep-sky treasures—and there are even a few two-for-one fields. Here’s a good example in the constellation Cygnus. 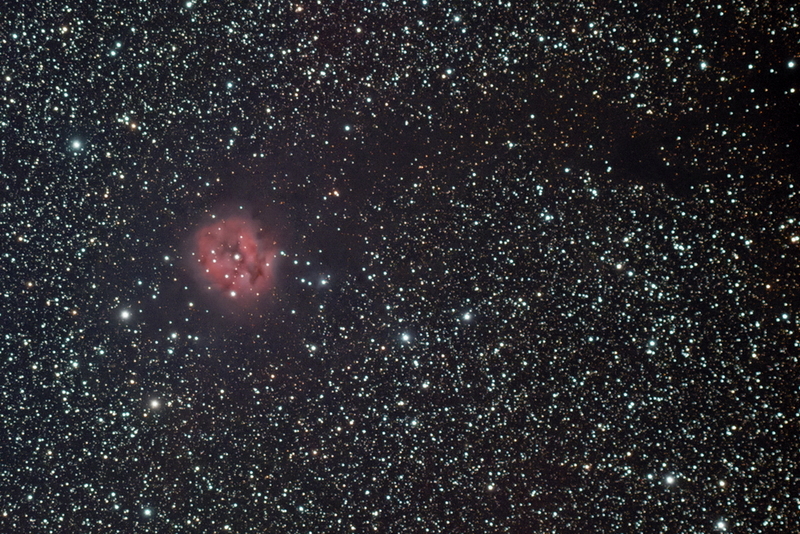 Most obvious object in the photo is the Cocoon Nebula, also known as IC5146. The nebula is a glowing cloud of hydrogen gas lit from within by a clutch of newborn stars. Object #2 is the lane of dark nebulosity called Barnard 168, which stretches from the IC5146 to the top-right corner of the image. If you have dark enough skies, B168 can be detected in binoculars, though glimpsing the Cocoon itself requires a narrow-band filter and moderately large optics. Luc Bellavance of Rimouski, Quebec, captured the nebulous pair with a QHYCCD QHY168C imaging camera and a William Optics ZenithStar 80mm f/6.8 apochromatic refractor telescope. A total of 60, 5-minute exposures were combined for the final image.